(Madison) - The wind industry in Wisconsin suffered a serious setback when a joint legislative panel voted to suspend the wind siting rule promulgated by the Public Service Commission (PSC) in December, according to RENEW Wisconsin, a statewide renewable energy advocacy group. The five-to-two vote tracked along party lines, with all five votes to suspend coming from Republican members of the Joint Committee for Review of Administrative Rules (JCRAR). Many companies involved in windpower supported the PSC’s rule as a workable compromise that would have created a stable and predictable permitting environment for all wind energy systems regulated by local governments. The rule, which was scheduled to take effect today, would have fulfilled the Legislature’s intent to create uniform siting regulations to replace what had become a restrictive hodgepodge of local requirements. “The committee gave the state of Wisconsin a black eye that, in the view of the wind industry, will linger well into the future,” Vickerman said. “As of today, Wisconsin utilities have placed more megawatts of wind capacity in neighboring states than in Wisconsin. 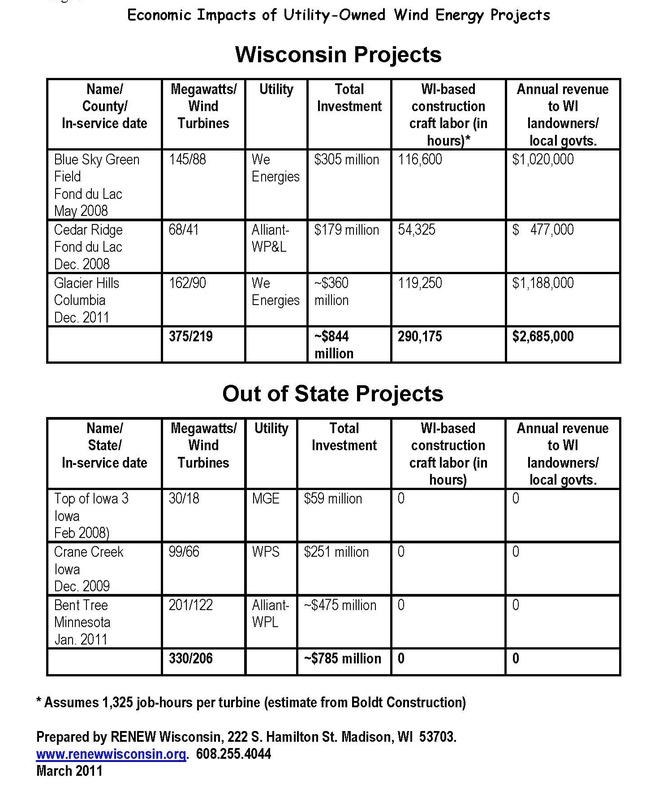 As indicated in the following table, importing wind generation from other states deprives Wisconsin of a valuable source of employment, income for rural residents, and property tax relief,” said Vickerman. The figures compiled by RENEW show that the 219 utility-owned wind turbines that will be operational by January 1, 2012, will yield nearly $2.7 million per year in potential property tax relief for towns and counties hosting wind projects. All told, these projects will be responsible for nearly 300,000 construction-related job-hours. “It’s a shame to see the end of bipartisanship that led to the passage of the rule requirement in 2009. What we are seeing here is a breakdown of governance that will rob the state of one of its brightest economic hopes for the future,” Vickerman said.